This is a common reason for readers coming to our site. They want to attach a GPS to a motorcycle. In some cases, the subject is very new to them and have no clue as to where to start or if it is possible. This article is for that reader where we will discuss everything from selection of a device to installation of a good GPS mount. It’s not hard to do. Think of this article as a primer for beginners.Many motorcyclists use a GPS on their motorcycle. Hooking a GPS up to your motorcycle can be an extremely simple exercise. Buy a good mount, attach your GPS and you’re done. It can also be a complex task. Mount it to somewhere that’s hard to reach, attach contacts to the battery, run a cable along the frame for power, attach your GPS and off you go. It all depends upon where you would like to put it, if you need to power it on longer rides, deciding if you plan to ride in bad weather and what kind of GPS you are using. If you haven’t selected a GPS yet, read the article we titled Can I Use a Car GPS on a Motorcycle as well as Garmin Zumo 590LM Product Spotlight as this gives a good overview on this topic. There are two types of devices that are highlighted in these two articles. The Garmin Zumo line is made for motorcycles and that means in withstands vibrations and weather the best, but it comes at a substantial increase in cost over a GPS made for a car. The Garmin Nuvi line of devices are made for inside a car or SUV. You can use a GPS made for a car or SUV, but you need to be sure to understand the limitations and the need for a good GPS mount. As to brands, Garmin is by far the most mainstream in North America with headquarters in the US. A second company called TomTom has a greater presence in Europe and a smaller footprint in North America. A Guide to Buying a Garmin Nuvi can help you select the right device. Once the GPS is selected, think about where you would like to put it. Most select the handlebar but there are a lot of other places to attach a GPS mount. In some cases, for example the Honda Goldwing, there isn’t a traditional handlebar such as those found on most Harley-Davidson motorcycles. In those cases, you may choose to attach it to the clutch or brake reservoir. In cases where you have a BMW motorcycle, a mirror stem mount is popular. In other cases, riders like to place the GPS mount on the fork stem. Use of suction cups and adhesive mount is not recommended as they aren’t made to withstand the vibrations of a motorcycle. There are three types of GPS mounts. The first type of motorcycle mount is one that uses a custom cradle that is made specifically for your model GPS. We prefer these mounts most of all because they provide the ultimate in stability. The company that makes these is called RAM Mounts based in Washington in the US. There are two components to this mount. The RAM Mounting Systems Handlebar Mount is a metal mount with a u-bolt that fits bars to 1.25 inches. Attachment is a simple process that involves a wrench or pliers to get the bolts over the u-bolt tightly (and they need to be as tight as possible). Adjustment points at the base and tip allows swivel and tilting. The component on the end features two holes which is typically attached to a RAM custom cradle . Each cradle comes furnished with a set of lock nuts and screws to attach it to the cradle. This part can be interchanged with other components such as an X-Grip cradle which we covered in great detail here, These cradles can be used to mount a device where the custom cradle may not be available. The next type takes advantage of the cradle that Garmin provides with the Nuvi model GPS. There is a 17mm socket on the back of the cradle and the mounts have a 17mm ball. An inexpensive favorite is the Arkon Bike or Motorcycle Handlebar Mount made for Garmin Nuvi models. The mount features a 17mm ball which is the size that you need to fit the cradle that came with your Nuvi. The mount bolts onto the handlebar and fits up to 1.25 inch diameters and includes rubber strips to protect the handlebar. Be sure that your GPS fits securely inside the cradle and we always recommend a tether where possible. 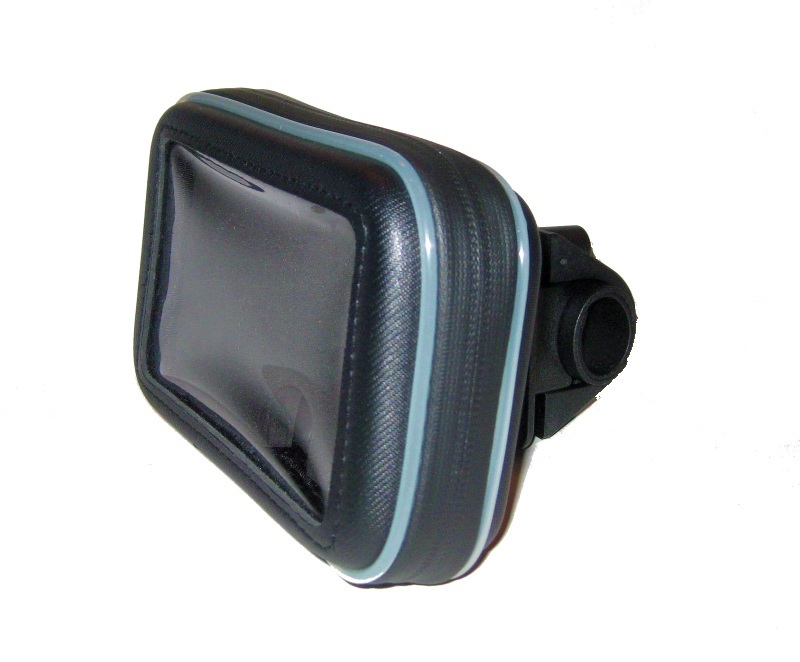 The last type of GPS mount includes a weatherproof case. The Arkon GPS032 Water Resistant Mount includes a weatherproof case for your device. These fit handlebars up to 1.25 inches and includes some rubber shims to protect your handlebar’s finish. The case is weatherproof meaning that it will keep your GPS dry in light to moderate conditions but it isn’t waterproof. There’s a port at the bottom to run the cable if necessary. The case zips shut and there is a lens that allows you to interact with the GPS. The case measures 5.5 x 3.5 x 1.7 inches internally. Pads are included to ensure your GPS stay up against the clear lens. It will fit most GPS sizes up to a 5″ diagonal screen and even some of the 6 inch models. All of the mounts that we discussed this far are for handlebars, there are many other mounts available for alternate locations. Read our articles on Mounts for Honda Goldwing Motorcycles and Mounts for Suzuki Hayabusa Motorcycles as well as Mounts for Harley-Davidson Motorcycles for more ideas. The life of a GPS battery varies by model. For example, a Garmin Nuvi 55LM battery life is two hours and a Garmin Zumo 590LM is up to four hours. That might be sufficient enough for your rides and if so, there’s no need to wire up a power solution. But if power is needed, it’s possible to add it by wiring a harness to the motorcycle battery and run the cable up the frame to your GPS location. Your GPS likely uses a mini-USB plug. Exceptions are the Garmin Zumo and TomTom Rider which have a cable integrated into the cradle or uses a proprietary cable pattern. Garmin Nuvi owners will need to purchase a hardwire adapter that includes a USB cable included. We recommend the Garmin Hardwire Cable which is manufactured by Garmin themselves specifically for this purpose. It has a fuse and the proper adapter for a Garmin Nuvi. Don’t even think about cutting off the end of your car charger as that’s a great way to fry your GPS. An article titled How to Hardwire your GPS to a Motorcycle or Car is a worthwhile read on this topic. Depending upon your level of comfort in working on your motorcycle, you may wish to have a professional do this. Hopefully this article gives enough guidance to answer the question of how to attach a GPS to a motorcycle. Use the search box located on the left sidebar to search on specific topics not covered in this article.